At Scotties Auto Body we are committed to our customers and our community. We sponsor athletics, drama, and grad night at Glencoe, Hilhi, Century and Gaston Schools. Scotties also contributes to many non-profit and civic groups. We have been proud to serve and be part of our community since 1957. We were awarded a position on the CRC’s “most highly recommended” report for our quality service and personal touch. We are proud to be members of the NATA, Certified First Network, LeTip International and Automotive Service Association. 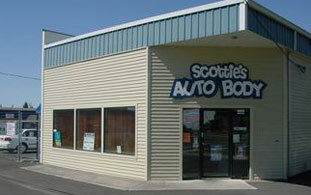 Scotties Auto Body works with insurance companies to provide you, the customer, with prompt, courteous service.